It would be nice if everything worked the way it was supposed to and stayed in like new condition forever, but that just isn't reality. Things break, they wear out, and from time to time they need a little TLC. If you've been hesitant to try Stockpile because you're overwhelmed by the thought of choosing a whole room to start with, this is the post for you. Today we've got some tips on how to use Stockpile just to track those items around your home that are in need of repair. That should be a much smaller, more manageable amount of items so that makes it a great way to try Stockpile. Whether you are the chuck it and buy new or the try to squeeze a little more life out of things kind of person, Stockpile can be useful when it comes to tracking worn or damaged items. If you are going to get rid of something it can be good to have a record so that you don't waste time searching for something you no longer own. Most people think that they'll remember what they got rid of but, more often than not, they forget. There's nothing worse than spending hours fruitlessly searching for something. Of course, replacing an item that you still have at home can be frustrating as well. Often items that are in need of repair get shifted to a temporary location. That could be the shoe repair shop, the tailors, or just a spot in your laundry or bonus room. Wherever it may be, they aren't where they are usually kept and that can make them hard to find. 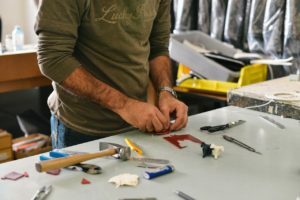 Whether it's sports gear or lawn equipment things break and you may need a little help to get them repaired. While you probably won't have any trouble immediately remembering where you took them to have work done, down the road you may not recall all the details. It can be helpful to have a record of who you used, how much they charged, the scope of work done, and when you had it done. This can all be helpful info to have later on if another issue arises. From the tiny toaster to the all important fridge appliances keep your home running smoothly. It can be very beneficial to have a record of when each item was purchased, what kind of warranty it has, and what repairs have been required. Especially with larger appliances you'll want to have a record of any repairs in case the lemon law comes into effect. You don't want to miss out on a free or discounted replacement just because you didn't track the repair history. Creating item records in Stockpile makes it easy to always know where items are. Using Stockpile is so simple. Because Stockpile is fully customizable you choose which fields to include in item records. There's no need to try to tweak a system to fit the data that you want to capture. You can create the system that will work best for you. As you're creating item records just remember that the more data you include the more information you'll be able to access later. Speaking of access, did you know that with Stockpile you can view your data anytime from anywhere? That's right. Stockpile is mobile compatible so as long as you have a mobile device and access to the internet you can see your stuff. It's important to use both areas and locations to be specific about where items are located. As things move around your home (or out for repair) it's easy to track them as well. Transferring items is simple. Stockpile makes it so easy to keep track of the things that you own. Try Stockpile today!